The Triangle is a double handed challenge open to cruiser and cruiser racer Monohull yachts of 25ft LOA or over. The event runs from Torquay to Kinsale Southern Ireland to Treguier Brittany and back to Torquay. The distance is at least 620 miles and lasts 12 days. At least 2 days are spent in each port with receptions, parties and even shore based sporting competitions laid on and there are always plenty of impromptu parties on yachts and ashore. If it is your intention to enter the Triangle Race 2020 please contact us. The enjoyment of two-handed sailing (no crowds below decks and no piles of wet gear everywhere) is complemented by the comradeship amongst all the boats and crews. 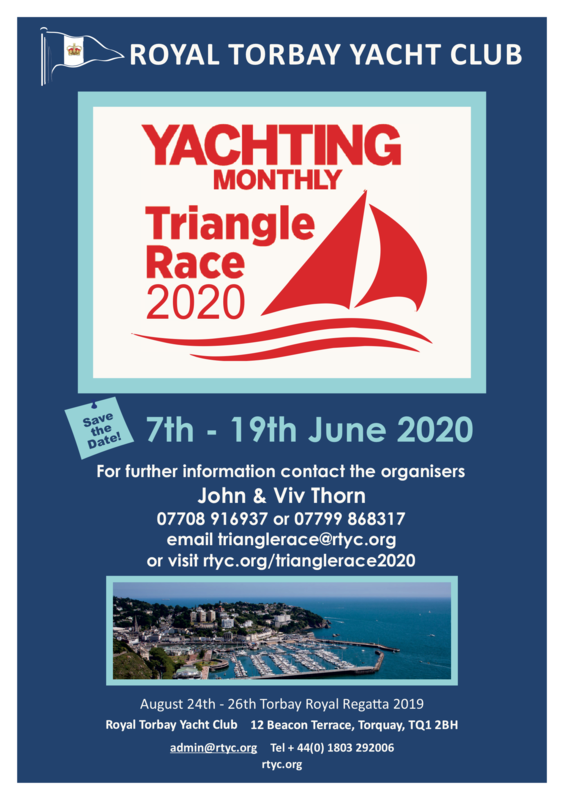 It is a great race for newcomers to two handed sailing with help and assistance from other vessels close by or over the VHF, usually enquiring how to cook a particular dish or have you seen the Dolphins! However, there is stiff competition too. The race is all important if only for who can get to the bar for the first pint of Guinness or Murphy’s! So, if you have not been two-handed racing before or not done the run to Southern Ireland and Brittany, now is an ideal chance. Both sailors experienced and new to two-handed are welcome.